www.MetroLondres.es is one of the sites with more information about the London Underground. In our web you can learn the history and origin of London Underground, learn how to use it, view and download current and old maps, see pictures, check schedules and fares, information on cards and payments, learn each line’s stations, plan your trip, etc. Basic information about London Underground. 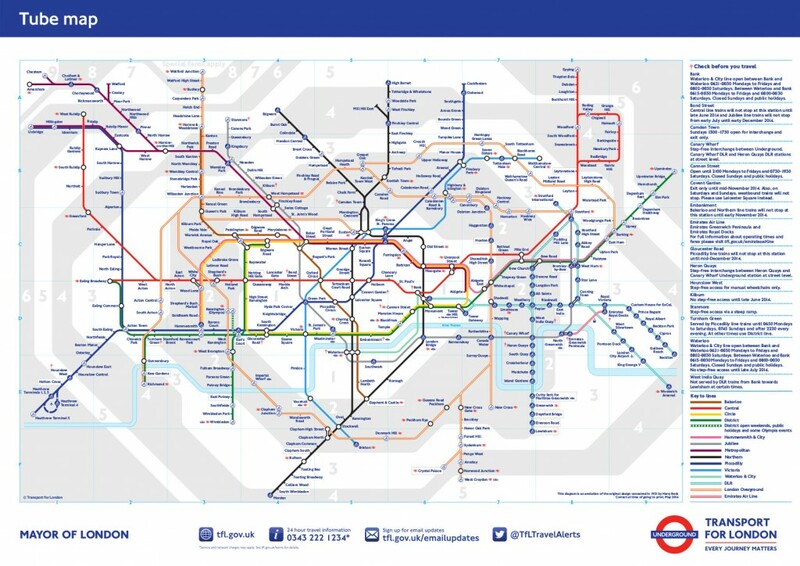 In order to download an updated version of this map you coud follow this link to London Undeground Official Site. Another link with more information and some other London underground maps is mapa-metro.com/en and, of course, Wikipedia. Lines: London Tube has 11 lines: (Bakerloo, Central, Circle, District, H’smith & City, Jubilee, Metropolitan, Northern, Picadilly, Victoria y Waterloo & City , London Overground and Docklands Light Railway (DLR). Schedules: from 5:00 to 00:00 from mondays to saturdays. From 7:00 to 00:00 on sundays. Service frequency: 5-10 minutes. Network length: 408 Kms of tracks. As you can see from the map above, the Tube, the Docklands Light Railway (DLR), the London Overground and National Rail London are splitted into zones. Most services operate between zones 1 and 6. Underground, Overground and national trains reach areas 7, 8 and 9. Neither the London Underground nor buses run on December 25.